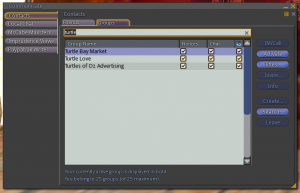 Friends/Groups are now searchable (thanks McCabe). 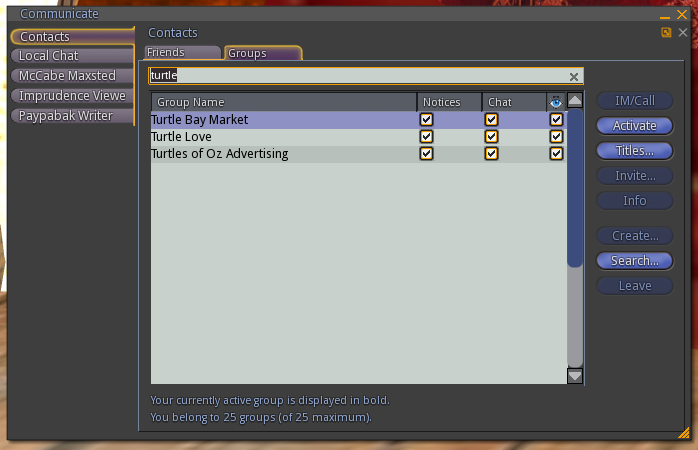 Complete fine tuning of Group Notices, Group Chat and Group Visibility in the Group management window (thanks McCabe). 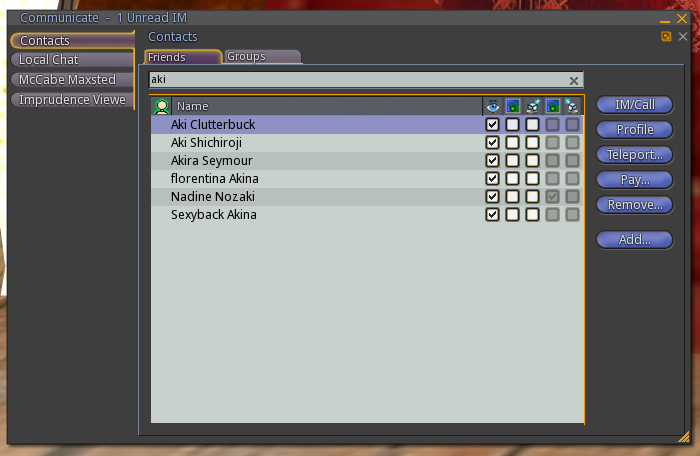 Added autocomplete for avatar names. Start typing a name in the chatbar then press TAB to cycle through potential matches (thanks Elektra). 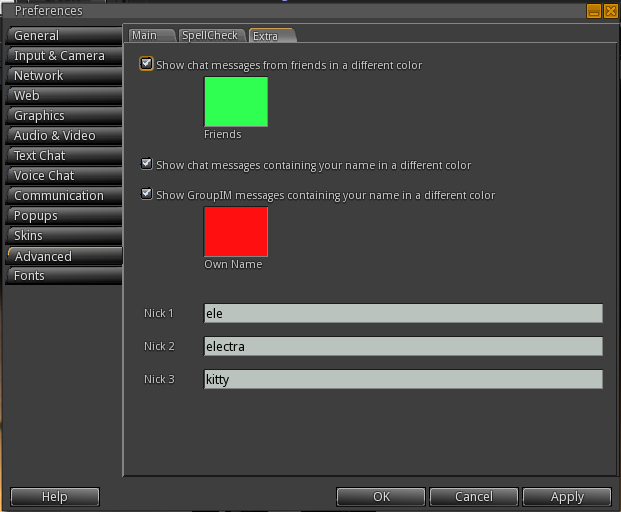 Added three “nick”s to also highlight when “show your name as colored chat” is enabled (Thanks Elektra). 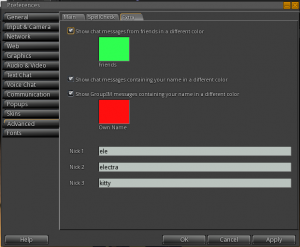 Added “Add Friend” to the profile button pulldown. Added notification when land you’re trying to buy conflicts with your maturity settings. Updated German translation of the UI (work in progress). Fix that works around LL’s current broken map. Imprudence now uses HTTP map textures when available. Fixed crash when downloading new dictionaries. Fixed crash in the audio engine. Fixed crash when using voice. Fixed spell check appearing in places where it shouldn’t (the login screen, for example). Fixed Hide Misspellings/Show Misspellings not re-enabling correctly. Fixed double-click teleports from happening on touch-scripted objects. Fixed IM history option for Macs. Fixed UI scale button not resetting to the correct default. Fixed LIB_JPEG CMake issue when compiling on a Mac. Fixed hardcoded “L$” in the god tools windows. Animation upload preview now defaults to enabled. Added links to the Imprudence blog and forums to the login screen menu. Rewrote the spellchecking preferences some. Re-added the Alt+H shortcut for Teleport History. Some tiny tweaks to the profile layout. Land auctions can now be held on OpenSim, provided you have the proper privileges. For any comments or feedback on this release, please post in the appropriate thread in the forums! Thanks! Works like a charm on Ubuntu 10.04.1 LTS, 32 bit. Thanks! I’m really liking the tab completion. Does auto-complete work in the local chat tab of the communicate window, or in group IM tabs and windows? Nice but I still get a crash running video under XP and Windows 7. It’s fine under Linux & OSX. Latest Quicktime installed, works ok with Kirsten’s. 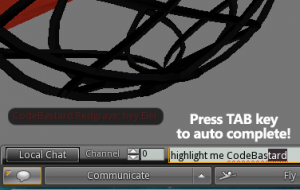 Would love to see the “add” feature for multi layer! Overall this is working without issue – and lets me hide when I wanna! Fixed the crashes by re-creating my OpenSim.ini file from the .example. Must have had an outdated config line in there that I had missed in my usual side-by-side compare I do when I update. Still low-priority need to not let the viewer be so easy to crash by a misconfigured/malicious server.